As long as deep-pocketed special interests from anywhere in the world can cut cheques to our politicians and sway government decisions, everyday British Columbians will face an uphill battle to be heard by our politicians. From oil tankers to U.S. thermal coal, old-growth logging to urban sprawl, Dogwood’s campaigns have always been linked by a common thread: the lack of accountability between elected governments and the people that have to live with their decisions. So when Dogwood decided to go directly to the heart of this problem, and take aim at the corrosive influence of big money in B.C. politics, we had lots of anecdotal evidence that British Columbians were fed up with unaccountable money pulling the strings, but we didn’t know for sure just how many people felt this way. Until now. 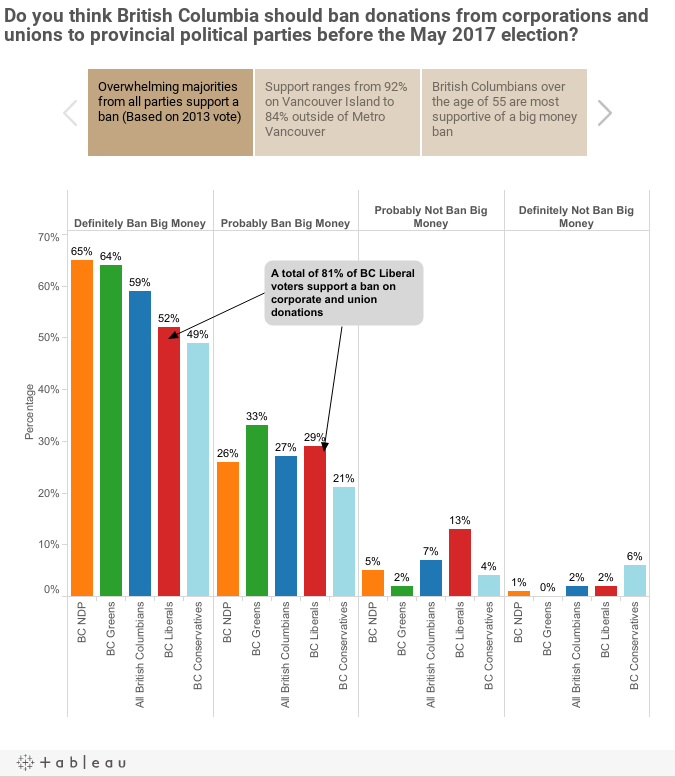 This week, Dogwood released a poll by Insights West to understand how British Columbians felt about unaccountable money controlling our political system. The answer: people are mad, and not just some people either. Nearly 9 in 10 British Columbians want big money out of politics now, before the next election. What’s even more remarkable is that these numbers are almost the same no matter where you live, who you vote for, or how old you are. Have a look at the full report if you like, then talk to your friends, neighbours, and co-workers to see if they feel the same way. Next, sign up with Dogwood’s Ban Big Money campaign at www.BanBigMoney.ca to help us reclaim British Columbia for British Columbians. PS. If you do happen find the 1 person in 10 who thinks it’s a good idea to allow unaccountable money to continue infecting our democracy, kindly direct their attention south of the border to see what happens when a corporate plutocracy goes unchecked. Thank you for all your good work. God bless you all. Keep it up. Most thinking people have felt this for years. Now we know. This information will surely strengthen our resolve to remove the provincial Liberals from power in the next election.